Adoeette, aka: Big Tree (1845?-1929) – Known as Adoeette to his Kiowa tribe, he was known to the white man, as “Big Tree.” In consequence of George A. Custer’s vigorous campaign on the Washita in the fall of 1868 the Kiowa and confederated tribes were forced to move to a reservation in southwest Oklahoma. However, by 1871, Big Tree, along with Chiefs Satanta and Setangya, and other Kiowa warriors were dissatisfied with the reservation system began to make a number of attacks on wagon trains in Texas. In May, 1871, Big Tree accompanied a large party of warriors led by Satanta, and attacked a wagon train, killing 7 men and taking 41 mules. For their part in this attack, the three chiefs were arrested at Fort Sill, Oklahoma to stand trial in Texas. Satank was killed while resisting a guard and Big Tree and Satanta were tried in Texas and sentenced to death; but Texas Governor Edmund Davis, overruled the court and the punishment was changed to life imprisonment. 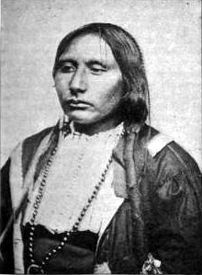 However, Kiowa Chief Lone Wolf negotiated for their early release and the pair were allowed to leave prison in October, 1873, conditional upon the good behavior of their people. The following year, Satanta and his warriors were back on the warpath, attacking buffalo hunters and engaging in the what is known as the Second Battle of Adobe Walls which occurred on June 27, 1874. He was later captured and committed suicide in prison. Big Tree, with other chiefs believed to be secretly hostile, were confined as prisoners at Fort Sill, Oklahoma. After his release, he continued to live on an allotment from the reservation until his death in 1929. Big tree was one of the models for the Indian Head Nickle.